In order to make builds for OSX and to do continuous integration on OSX we will use the travisci infrastructure. It currently supports 10.9, 10.10, and 10.11. Whilst pygame can still as of half a year ago compile on 10.4, it's hard to keep these machines accessible to people. Most important is to get it building and running tests, and secondly to generate a .wheel for the latest OS X.
René, is it risky to commit directly to the mirror? I don't know exactly how the mirroring works, but it looks like if anyone commits anything on Bitbucket, the mirror update will blow your changes away. Yeah, it's risky. I'll set up another one. I just wanted to quickly play with something. Still reviewing different projects to see how they do it. So far it seems like the best approach is to download the required pythons and build against those. It's what scikit-learn does amongst others. I can use the script they've already made, which is nice. Yeah, I think the osx images only come with the Mac system Python, so it's necessary to download other versions somehow. I have got tests running on the two versions of Python available through Homebrew - see pull request #66.
see if we can save a png with color values in the proper channels. make sure the color key is not changed when saving. see if we can load a png with color values in the proper channels. Hi. I'm working on this again. This issue seems to be about missing libraries not being installed. eg, libpng. For the wheel versions, the other main issue is installing 'Framework' builds of the dependencies. Previously this was done into a shared folder. Which of course means this doesn't work for virtualenv based things. It also can require permissions to install. The solution is to bundled the dependencies into the installed pygame folder for the wheel version. Either the .so files or the framework files. Bundling in the dependencies probably also makes sense for the dmg. How do I install libpng and retest? It says PNG : found when configuring it - do you think that's erroneous, or that it's finding libpng at compile time but not at runtime? For wheels, we essentially have to bundle any non-Python dependencies (at least for now), because no code runs at install time. For OSX, the delocate tool can help us do this bundling. For reference, auditwheel is a similar tool for Linux, which I've already used in my attempts on #295. My experience on OSX is from more than ten years ago. So you will have to tell me which commands to run to get the information you need. I can find all the libpng files for you and list those. I have no experience on OSX, so I can't really help you, unfortunately. It sounds like @René Dudfield has some familiarity with it, so hopefully he can work out what needs to be done. For the png/etc errors it was picking up the wrong headers. Using the X11 stuff. There's still two issues left, and I haven't done the X11 stuff properly yet. I'm thinking of not using it at all on OSX. I'm not rejecting the idea of splitting pygame up into pieces, but just to reiterate my position: for now I think we need to focus on getting a release out as soon as possible, so any architectural changes should be postponed until after that. Agreed. If illume needs more testing the next days, let me know. For Linux it is working fine for me. I will go through more examples and let you know if I find anything. Do you who is the person that does the packaging for Debian/Raspbian/Ubuntu? You can see info on the Debian packaging here: https://tracker.debian.org/pkg/pygame . Vincent Cheng appears to have been the uploader for recent pre-release packages going into experimental. Once it's in Debian, it should automatically wind up in Ubuntu and Raspian - but depending on how release cycles fall, it might take months to years before it's available to regular users through their distros. Indeed it can take a long time, but quickly notifying packagers that there is a new version with all the information they need sometimes helps a lot. I have gotten packages repackaged and released in a few weeks. Packaging itself can be quick, but then we'll be waiting for the next release of the distros, which is what takes months to years. Freeze of Ubuntu Yakkety 16.10 is August 18th. Yes, communicating with packagers is very helpful. Also going through the different distros and taking their diffs/patches is helpful for all the other packagers. Concentrating on using getting pygame packaged as a wheel for OSX is my main goal for now. I'm trying to reuse the binaries that homebrew makes. I believe delocate is capable of rewriting the linker paths embedded in compiled libraries, but I don't understand the details. ps. I disregarded statically linking things because then SDL(etc) would be linked into every .so file we have, and there are a lot of them. This at least works with libpng, and I was able to load png files ok this way. So now I need a tool that will go through all of the .so files, and make a set of .dylib files which need copying into the folder. Then it needs to copy them, and then rewrite all the paths in the .so files to have @executable_path in front of them. Oh, delocate looks the thing to use. If anyone wants to give it a try and test it out? I moved away all of the .dynlib files and it seems to run ok.
One oddity though. With a fresh virtualenv it didn't work. But when I pip install --upgrade pip setuptools it works after that. Next step is to get travis to create them. One problem is that it does not include the i386 arch by default. So I need to build all the architectures with homebrew and get pygame to build with i386 as well. This fails if both intel architectures are not available. Seems portmidi, smpeg, and fluid-synth do not have a --universal flag with homebrew. It also makes installing the libs take much longer (because they have to be compiled from source). Really, only portmidi needs to be fixed I think. smpeg is unsupported by us now. fluid-synth is wonderful, but also not really required. If it's going to be difficult, I'd be in favour of offering only 64-bit Mac wheels for the time being - in keeping with my 'reduce the problem until we actually have time to solve it' strategy. If people are clamouring for 32-bit Mac support, we can return to it, and possibly enlist them to help. This SO answer says that all Macs sold from mid 2007 are capable of running 64-bit software, so I wouldn't be surprised if there's little pushback. Do you want to upload the wheels you've got as part of the beta on PyPI, so Mac users can easily test them? I don't think it's difficult to leave out portmidi for now. pygame loads without pygame.midi by default so for most people it will work fine (hopefully). I have compiled portmidi for both architectures before, it's not that hard. But yes, I will delay sending patches to homebrew and concentrate on getting travisci to upload the osx wheels. I've manually uploaded two .whl files I built on my own computer for testing. There are probably better approaches out there, but this is small enough to be quickly understood. Seems I accidentally fixed the music loading failing test. There is still the png loading issue. Looks like transparency is not there either. That sounds like there's another problem besides the lack of transparency, but I'm not spotting the other problem in your screenshot. (env2)15:58:30-rene~/dev/pygame/git/pygame (master)$ python -c "import pygame;print(pygame.image.load('examples/data/alien3.png'))"
Seems that SDL_image is broken for color mapped images, as well as the greyscale images. I vaguely remember someone made this change to SDL_image on OSX so it uses the built in png loader (but not correctly it seems). Perhaps an older version still compiles. Will investigate when the change happened and try that. Here is the page which describes the SDL_image png issue (for future readers). I had the same black backgrounds in the sprites of aliens. Is that SDL or libpng problem? Do we need to report a bug or feature request at homebrew regarding the --universal flag? I have a fix, and am going to submit a pull request. Until/if it gets accepted I'll create a separate Formula for travisci to install with. It's probably good to sort out the various issues, and merge them in that one instead. For now I've forked homebrew and linked to the formula that works for me. Well, it seems to be passing all the tests now. Takes 32 minutes to do a build but. I guess this is another thing that could be improved in the future. I added the upload script, and I think it 'works'. It makes binaries for OS X 10.9. Nice one! Is the code ready to be added to this repo? I added the extra OSX builds (10.10, 10.11) in there. But they time out after 48 minutes. I guess the homebrew on there is slower or something. So I will have to figure out a way to cache the homebrew builds. I guess someone else has done this before though. Once I figure that out I'll create a pull request. Or maybe there is nothing 10.9 specific in there, and we can rename those files to be used on 10.10, 10.11. I believe it's generally the case that stuff built on one version of OSX can be moved to newer versions without a problem, but I don't know the specifics of this case. @Matthew Brett may be able to provide useful information. Well, I just installed a 10.9 whl on a 10.11 machine. So I think we just need to make whl files for that, and they work for any later version. Trying a build again. For OSX versions and wheels - please have a look at https://github.com/MacPython/wiki/wiki/Spinning-wheels . The basic message is - build wheels with Python.org Python, the wheels will work for all standard OSX Python installs - specifically for OSX >= 10.6. Thanks Matthew! Is it necessary to ensure that the extra libraries getting bundled were compiled with the same SDK? If we install Python.org Python but get other libraries from Homebrew, will extensions compiled on Python.org Python see that? Yes, I think you will need to build the extra libraries with MACOSX_DEPLOYMENT_FLAG set to the same SDK. Well, specifically, the compiled libraries should be expected to work on that SDK or higher, so if you compile your extensions with MACOSX_DEPLOYMENT_FLAG=10.6 (the default for Python.org Python) and your libraries with MACOSX_DEPLOYMENT_FLAG=10.9, then you can expect your resulting application to work on 10.9, but it will likely crash (in the library code) for OSX < 10.9. If the wheel tag specifies x86_64, pip will refuse to install it on i386 Python, won't it? So long as that's the case, I think we can keep things simple and stick to 64-bit for now. We can always come back and enhance this later. The problem with that, is that pip will also refuse to install x86_64 wheels on system Python and Python.org Python, because these identify themselves as dual arch (intel). These two are a fairly large proportion of the OSX wheel market. So the choice is - lie about the compatibility by saying the wheel is dual arch when it isn't, on the basis that it's unlikely anyone's ever going to test the i386 architecture, or jump through some possibly significant hoops to make a dual arch wheel. What times out exactly? The SSH connection? Matthew: ah, gotcha. That's a pain. If you went for a year without complaints, I'd probably still lean towards x86_64 masquerading as dual arch, but it's up to @René Dudfield. The other problem with the homebrew libs, as you were implying, is that they usually (always?) use the SDK of the OSX version (10.9 SDK on OSX 10.9), so, to use the homebrew libraries in a wheel (with delocate), you'd have to restrict the wheels to (the OSX version of the homebrew you compiled with) or later. Thanks for all the words, tips and links. I set a few caches, and tried some parallel builds and test runs. Which still doesn't stop that font test which hangs. I'll investigate that next. Also added the travis_wait command to the before_install which used to take 2000+ seconds. Another thing I did was rearrange the builds so that they are in dependency order, so eg, sdl isn't installed (without universal) and then sdl is installed again with universal. I tried MACOSX_DEPLOYMENT_TARGET=10.6 but ran into an issue. Oops. It went directly to the main branch. 2cee182f6ccfe708a78c5f15912d0ee7e7f5e1a3 I meant to make a pull request. There's a problem with adding environment variables from europython, I think travis is blocking the ip now. So I'll have to do that later. It worked building and uploading from my 'pygameplay' fork though. I'm not sure what to do with the versions though. Note the b version doesn't seem to require the --pre in pip install --pre pygame, just pip install pygame works. Note the b version doesn't seem to require the --pre in pip install --pre pygame, just pip install pygame works. This might be because no there are no previous versions of pygame downloadable from PyPI; I have certainly seen it working with other projects. We have tests running and wheels building on Travis, so marking this as resolved. When I had older libng installed in /usr/local/lib OS X 10.11 then I got "libpng warning: Application built with libpng-1.6.23 but running with 1.5.4" and loading png failed with message about incompatible pnglib version. When I removed the versions from /usr/local/lib, then I got loading error "pygame.error: Failed loading libpng.dylib: dlopen(libpng.dylib, 2): image not found". Seems that imageext loads the correct pnglib but SDL_image looks for it in the wrong places. I tried setting DYLD_LIBRARY_PATH to .dylib folder but this didn't help. When I installed libpng 1.6 to /usr/local/lib, then I was able to load png-s. Similar thing with jpg-s -- when I had correct version in /usr/local/lib, then everything worked, otherwise not. Yeah, that seems to be the problem. I'll add that for the OSX builds too. Opening because of png dynamic linking errors. By the way, currently there is no wheel for 32-bit OS X 10.6 (pip install pygame says "No matching distribution found for pygame" ). Does it mean that this system is not supported or the wheel is not there yet? The problem is that Travisci, and modern xcode (well, 3 previous releases) does not support that. After the release I might go to the effort of installing an old OSX, and an old xcode to make wheels for older platforms. There's a possibility that the tools we use to make the wheels won't work however. Two days ago I got an old Mac laptop I can use for testing. So it's at least possible for me to do now. Can you please explain your situation more? Is it for a class room? If we hear there are more people using older OSX, then there might be more motivation for people. Is the process to build SDL the same on OSX as on Linux? Could we run the build-sdl-libs.sh script we already have from .travis_osx_before_install.sh? Or can we pass configure options directly to brew install? Heads up @René Dudfield: it looks like the Github mirror has stopped updating from Bitbucket. I have manually updated my copy on Github, and the builds work. I haven't yet tried adapting it to build sdl & sdl_image with those extra flags. I tried using a copy of the script we use to build SDL in the Linux docker images, but it failed to compile SDL. I'm rather out of my depth to fix this, and the push to Github/wait for Travis cycle makes testing hypotheses very slow. This needs someone with more knowledge of C and/or OSX to look into it. I made some improvements on building on macOS, it seems to build and test fine, but I did not yet test the wheels. I still need to clean it up a bit and will then create a PR here on bitbucket (if desired). Is building a universal binary still a real requirement? (32-Bit Macs are quite old, 10.6 is the latest running OS and the build process is rather slooooow). Installing and building using homebrew works quite well and is also my preferred method of obtaining pygame. I created an updated PR at https://github.com/Homebrew/homebrew-python/pull/360. Their bottling process makes the install also quite fast. I'm sure, that as soon as an 1.9.2 release is tagged the PR will be merged quite fast. (I will update the PR there then). Thanks @Tommy Sparber ! I'm not very familiar with mac stuff, but if it simplifies stuff I think it's fine to build for only 64-bit for now. We seem to be struggling to get a release out, so I'm in favour of aggressively confining what we try to do, so we can actually get there. If we're not confident the wheels are behaving themselves, I think we should make the release without Mac wheels - as you mention, people will still be able to get it from other sources like Homebrew. The wheels seem to build now, but I'm not having any luck installing them. Renaming the files to end in -macosx_10_11_intel.whl (notice the underlines) makes them install. I think delocate has some issues to name the wheels correctly. I figured out the naming issue: transfer.sh was replacing all the underscores to dashes. The latest run now builds sucessfully, but the wheels are missing some dylibs. I added a test where all homebrew libs are uninstalled and the pygame wheel is installed into a new virtualenv. The libpng, libjpg dylibs are included but with their versionnumber. dlopen expects no version number as far as I can tell. libvorbisfile is not included. @Matthew Brett any idea on how to include some extra dylibs using delocate? I think I've seen this problem before - I've actually managed to manually build an OS X wheel of an old version of pygame (in a bit of a hurry) to include in the Tingbot IDE. The problem is that SDL_image loads the PNG, JPEG and TIF libraries using SDL_LoadObject, which tries to find the libraries by resolving against some search paths and then doing dlopen on them. So, delocate isn't going to be able find those libraries since they're not included in the output of otool -L (it has bundled libpng because that library is referenced by libfreetype, but it's not finding that correctly either as it needs a symlink). I see above that there are some references to SDL_Image compilation flags - perhaps they would fix the issue? I think the relevant flags are --disable-jpg-shared and --disable-png-shared. Yes, those flags would (so I assume) statically link libpng and libjpeg. But this would not solve the issue of the missing libvorbisfile.dylib and if you say with libfreetype (haven't seen this myself yet). Also adding the compiler flags to SDL_image needs changes on homebrew (possible, but I would like to avoid further changes if other methods are required for libvorbisfile). Maybe creating the relative symlinks can be added to delocate. Sorry, I misspoke above - there's no problem with libfreetype, just that the libpng that is included by libfreetype isn't found by SDL_image. Ok, I'll try to add the flags later. If everything is fine, I'll create a PR for required travis changes. The osx_image: beta-xcode6.2 (with 10.9) will only be available until 28th Nov (=today). The osx_image:xcode6.1 (with 10.9) will be only image with 10.9 and is only available until 17.01.2017. See https://blog.travis-ci.com/2016-11-17-retiring-some-osx-images/. The next best option would be then osx_image: xcode6.4 with 10.10. Is it not possible to build on a later macOS for an earlier version? Would you reccomend to use MacPython? According to this table its platform tag would be macosx-10.6-intel. Maybe I need to find way to build sdl for an earlier version. Thanks - yes - that does import correctly at least. I guess MacPython is preferable to system Python, in the sense that it claims and might provide compatibility with versions back to 10.6. I can give you access to a 10.6 machine if that would help. Thanks @Tommy Sparber and @Joe Rickerby for all your hard work on this. I'm going to add the extra SDL build flags you've found to the Linux build too. I see that those Homebrew PRs were merged, and it sounds like the options we need to use became the defaults. So am I right in thinking that rebuilding the wheels with the Travis CI setup we already have will make it work? Do we need to do anything to use the new Homebrew recipes? Is there anything else we want to change about the Mac builds before doing a release? It looks like the way we currently build them produces wheels for 10.9 and above. Mac users, could you test these? In particular, it would be good run the aliens example game and check that the PNG problem shown in the screenshot above is fixed. I see these wheels are now showing up as requiring OSX 10.11, presumably because of changes to the Travis defaults. It looks like we can get back to 10.10 easily enough (assuming that doesn't break the build). Is that sufficient? Or should we change more things to try to support older versions of OSX? Also, for some weird reason, the Python 3.5 wheel gets the intel arch tag, but the 2.7 wheel gets x86_64. Is there a better way to fix that than just renaming the 2.7 wheel? Sadly I have OSX 10.9 myself. Did you build the wheels with the xcode 6.4 image and MACOSX_DEPLOYMENT_TARGET=10.9? It doesn't explicitly set the osx_image, and it looks like the Travis default is XCode 7.3, on OSX 10.11. There's a commented out line in the Travis file for MACOSX_DEPLOYMENT_TARGET=10.6. Is it that simple? How far back can we set the deployment target and expect it to work? I think that MACOSX_DEPLOYMENT_TARGET=10.6 should compile (it's the default for Python.org builds, that most of us are using to build OSX wheels on travis). I'm guessing that the practical incompatibility is from the homebrew libraries you are pulling in, which presumably were compiled against, and depend on, the OSX version you're running on. Many, but not all, of the Homebrew packages it installed were compiled from source. Does MACOSX_DEPLOYMENT_TARGET affect Homebrew builds? I don't know which piece looks at that variable. Unless there's an easy way to get those libraries in a format compatible with older versions, then I think building on Travis limits us to 10.10. The statistics I can find (here, here and here) suggest that a majority of Mac users are on >=10.10, but maybe 20-30% are still on older versions. Given that this release is already long overdue, is there anything simple we can do to make wheels for older OSX versions? If it's not simple, I'm inclined to say 10.10+ is good enough - users on older versions will still be able to install it, just not as a convenient wheel from PyPI. Given that the current oldest Apple-supported OSX is 10.9, why not build the wheels for that version, using the beta-xcode6.1 image, soon to be retired? Error: Failed to download resource "sdl"
I'll try on the 10.10 image. Setting the deployment target does not work for hombrew without patching it. It is always overwritten. Even when using env=std. Setting it in the formula works or replacing the os detection in brew.sh seems also to work (or patch it somewhere else). I would also suggest to test the wheel after building it (remove everything from homebrew and install the wheel and repeat the tests). This shows for example missing dylibs. If the wheel is build using macpython it identifies itself as compatible to 10.6 (but there might be issues with older versions). Maybe the 10.10 built also work on 10.9? (did not test yet). Downloading the bottle on beta-xocde6.1 works. Maybe its a temporary issue with libsdl.org. Or disable the universal build. The wheel name contains the intel/x86_64 based on the python version/variant not if the contained dylibs are universal. Maybe its a temporary issue with libsdl.org. I thought that, but the same thing occurred across 3 builds (the 2 it runs, plus I restarted one of them). I tried downloading the same URL while they were running, and it worked perfectly normally on my computer. And it's working once I switched to the xcode6.4 image. It could still be random failures on the server hosting the files, but I think some difference in the image downloading them is more likely. Or disable the universal build. The wheel name contains the intel/x86_64 based on the python version/variant not if the contained dylibs are universal. I was wondering about that. We're not building everything with the --universal flag (some packages reject it). So should we not try to build fat binaries of anything? Presumably it's only useful if all the libraries we use are fat? And I guess it would save quite a lot of time if there are 'bottles' of the x86_64 libraries. It would be great if people could test these. They're both tagged x86_64 now. I guess we should rename them to intel so pip will discover them on more installations? Yes, please do rename the wheels so they get found by Python.org and system Python. Wheel installs fine, plays music, graphics look OK. I get the impression from the code that I should be able to use the keyboard to move the player sprite, but that does not work. Also (I guess this is a Mac / pygame thing?) the window does not get focus when I start it, and cannot be put to fullscreen. Seems to work as expected when run from Idle though. Thanks Matthew! The focus issue is #203 - I've no clue where to start on fixing that, but it isn't something introduced (solely) by building wheels. You should be able to use the keyboard to control it - left/right arrows, space to fire. Apologies if this is obvious, but you weren't trying to use WASD, right? When you say it works as expected from IDLE, does that include keyboard controls, or just the focus issue? And just to double check, the graphics don't include the black boxes around sprites seen in the screenshot above, right? Right on all counts - was trying the arrow keys and spacebar for the controls. These do work from Idle (is this using Tk? ), as does the focus. The graphics look fine, and don't have the black boxes in the screenshot above. Aha, thanks for the info! So, if I'm following all that correctly, it's all working correctly when using a framework build? I don't think it's using Tk - as far as I know, SDL includes the windowing features itself. But it does look like the same effect. This seems like a trivial operation, but could you double check that I haven't misunderstood anything about the rename process? Hopefully this should be the last thing to check. That looks fine - I think that all you need to to is rename, and I just installed the wheel without problem. You can also write the tags inside the wheel, but as far as I know, pip does not use these for the install. I'm closing this as the wheel build seems to be working now. We have #203 for the virtualenv/non-framework Python issues, and we can open new issues to track specific failures. 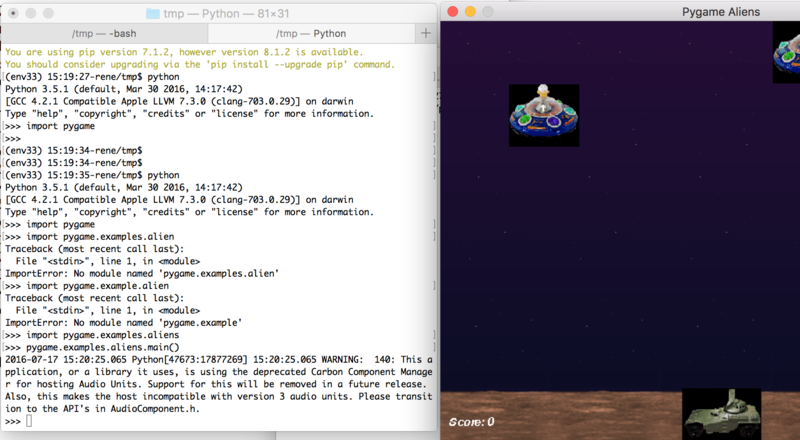 I can report that aliens.py example works for me with rc1 wheels from pypi on El Capitain and Python 3.5. Seems there's issues with the whl files. On my mac keyboard and mouse input doesn't work. @René Dudfield is it possible you were installing it into a virtualenv (or another non-framework Python build)? There are some issues with that case being tracked as #203.